If you’re ready to book, you can do so now by clicking the button below. Otherwise, please dismiss this box and read on! Over the years, we've shared this special place - and our knowledge of it - with tens of thousands of people. Whether you're interested in geology or seabirds, or if you just fancy being out on the water for a few hours, we look forward to welcoming you aboard and hope you'll enjoy the trip. 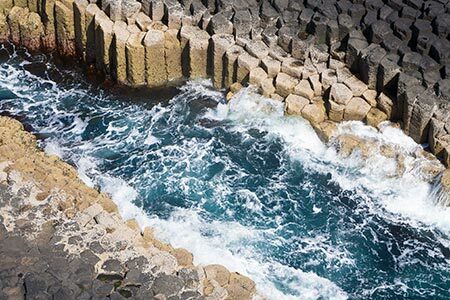 In the Spring of 2019, Staffa Trips changed hands. Davie & Carol Kirkpatrick, who’ve owned and operated Iolaire of Iona for the last 27 years, have decided to retire. 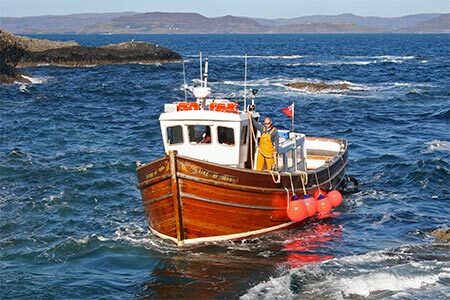 They are delighted that Graham Tindal, a native of Iona who’s skippered boats to Staffa for many years, and his wife Sara, have taken over the business and will continue to operate the boat from here. Regrettably, we won’t be offering a full day tour from Oban in 2019. Aside from this, Graham and Sara intend to keep things very much as they are at present. All of the contact details here will put you in touch with the new owners. The Isle of Staffa – off the west coast of Scotland – is a beautiful uninhabited island, famous for its dramatic basalt columns, sea caves and bird life. Over the years it has captivated thousands of people including Johnson & Boswell, Queen Victoria, Robert Louis Stevenson, Walter Scott, Jules Verne and Joseph Banks. Fingal’s Cave is always splendid and atmospheric with its basalt columns formed during a period of volcanic activity 59 million years ago. 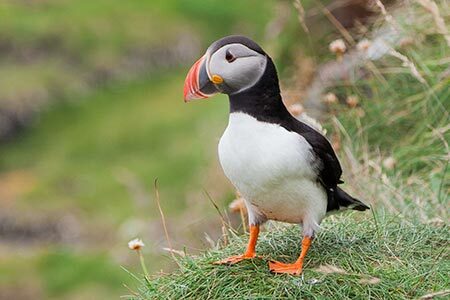 Puffins can be seen ashore in season as well as shags, oystercatchers and black guillemots. We often see guillemots, razorbills, fulmars, kittiwakes, shearwaters gannets, great skuas and other birds from the boat. If you’re lucky, you might see a passing otter, porpoise, dolphin, basking shark or whale! The trip lasts approximately three hours and you can disembark at Fionnphort or Iona. Staffa Trips leave Iona and Fionnphort twice daily (1st April-31st October) and we aim to give you at least 1 hour ashore. We’ll do our best to make your trip as enjoyable as possible. Staffa was formed during a period of intense volcanic activity some 59 million years ago. Slow cooling of basaltic lava cause the resulting rock to have a polygonal joint pattern. Most of the columns are 5 or 6 sided and free standing. The area in which we operate is home to a wide variety of seabirds including Cormorants, Shags, Guillemots, Razorbills, and Shearwaters. Puffins nest on Staffa each year, arriving in early April and leaving again at the end of July. They can often be seen ashore at close quarters during May, June and July. 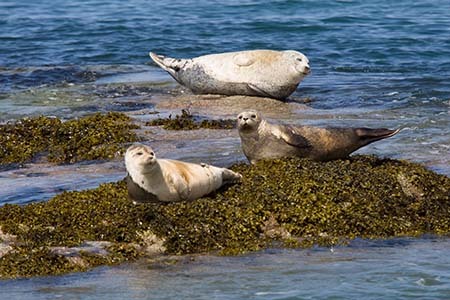 The water around Staffa is home to a wide variety of marine life and we see common seals on most trips. Porpoises and Dolphins are seen fairly regularly, while Minke Whales and Basking Sharks visit when the water is warmest in June, July and August. Staffa Trips’ boat, Iolaire of Iona is a beautiful wooden boat, purpose built to take visitors to Staffa. She’s constructed from larch planks on an oak frame in the carvel style and powered by two diesel engines. She’s lifted out of the water each winter and inspected twice yearly by the MCA. Prices: £35 Adult, £17.50 Child (5-15). Under 5’s free. Please note: All trips and landings are subject to suitable weather and sea conditions. Winter storms between 2017 and 2018 caused damage to the walkway at the entrance to Fingal's Cave. The National Trust for Scotland tried to make a repair in 2018 but this was unsuccessful. The timescale for a further attempt is unclear. The causeway and pier remain accessible in good weather and views from the Iolaire remain unchanged. Whilst you can still walk along to the cave, entrance is prohibited. Read the press release from the National Trust for Scotland here. We will update this notice as soon as we know more of the NTS’s plans. The images below are the latest from our Instagram page.